The “Hôtel de Ville” in Lyon is one of the city’s most important historical monuments. It is found between Place des Terreaux and Place de la Comédie, directly across from the opera. The building has been protected as a historical monument since 1886. The “Opéra Nouvel” houses the National Opera of Lyon. The opera house was originally built in 1831, before well known French architect Jean Nouvel put signifycant time and effort into converting it between 1985 and 1993. As a result, the building was then named after him. The heating systems of the two buildings were, like in many other communities, technically out – dated and oversized. 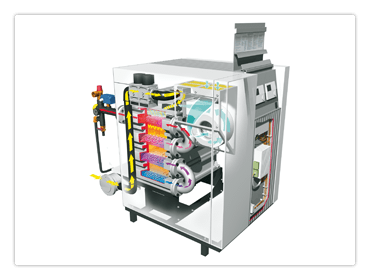 The result was high exhaust gas temperatures, discomfort and signify cantly excessive heating costs. ELCO had scored with the city for many years with its reliable customer service. The old system registered virtually no disruptions. This also played a role in the decision to go with a modern heating solution by ELCO in the course of the renovation. Two RENDAMAX 3504 gas condensing boilers today provide both buildings with central energy-saving heat.